This is part of a series of posts for an online class on how to use your investments to fund your retirement. To find other posts in the series, select the category “Retirement Investment Class” under “Retirement Investing” at the top of the page. In the last post in the series we discussed what mutual funds, index funds, and ETFs are. Now that you are armed with this information, the question is then, “How do I select funds to invest in with all if the choices out there?” Today we’ll cover how to determine what mutual funds invest in, which ones you’ll want to choose for a retirement investing plan, and how to select the best funds from a group of possibilities. Probably the best source of information on a mutual fund is its prospectus, which can be found at the website for the fund family. While there are a lot of fund families out there, you’ll want to choose one that features index funds, since those are the least expensive. As we discussed in the last post, index funds will outperform most active fund managers. Vanguard and Charles Schwab both feature several index funds. Today we’ll look at funds from Schwab. You can find a listing of their index funds here. Hey – if you like The Small Investor, help keep it going. Buy a copy of SmallIvy Book of Investing: Book1: Investing to Grow Wealthy, buy one of the products shown, or just click to go to Amazon and then browse and buy something else you need. Since this is an index fund, the goal is to track the performance of the underlying index, good or bad. Since the S&P500 Index is a list 50 large US stocks, this fund would be a way to get exposure to large US stocks. It does this by actually investing in the stocks in the index. The fund may also invest in derivatives instead of buying the stocks themselves, which could add to the risk of the investment, but in this case it is probably fairly safe due to the nature of the fund. Here the manager is just trying to replicate the performance of the index, not to time the market using derivatives. The main purpose of looking at this element is to see how the fund has performed over the past several years in comparison to other funds and the relevant index. Here you can see that the fund, SWPPX, has tracked the S&P 500 index very well. 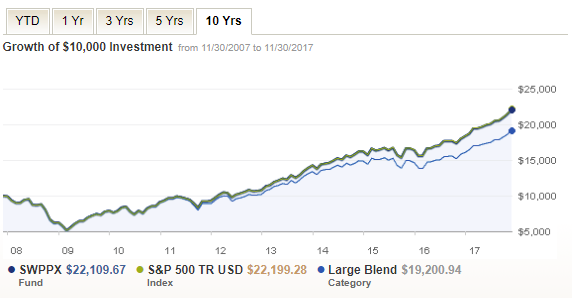 An investment of $10,000 ten years ago into the fund would be worth $22,109 today, where an investment in the index (if you were able to do so) would be worth $22,199. This is better than the $19,200 that an investment in the average large blend category would provide. This is the type of performance you want from an Index fund – close tracking of the index. The 52 week range gives you a general idea of how much the fund moves around in price. Over the last year, it has moved about $9, or around 25% in price. The YTD return shows how it has performed this year-to-date. In this case it has increased about 22% because the S&P500 is having a good year. A good YTD return isn’t always a good thing. It is nice to see that a fund has done well when the markets have done well, but great performance last year may mean that the stocks in the fund are overbought and may not do as well next year. The fund expenses are very important. 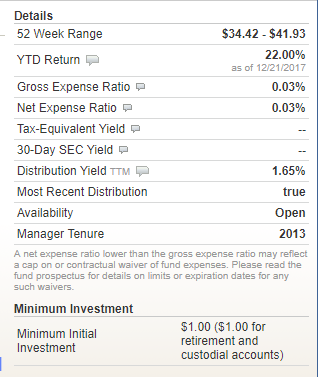 With the gross expense ratio and net expense ratio at 0.03%, this is a very inexpensive fund. This is the percent of your investment that will go to fees each year. For example, if a fund has a 1% expense ratio, you’d be paying $10 each year for every $1000 invested. A typical managed fund will charge 1% or more. An index fund will usually have fees between 0.25% and 0.5%. You’ll generally want to find the cheapest funds you can find unless a more expensive fund invests in an area you can’t access otherwise. The distribution yield is also important for retirement investing. This fund pays a 1.65% yield, which means that you’ll receive a check for $1.65 for each $100 you have invested each year. You’ll want to have some funds that pay quite a bit more, like $5 or $8 for every $100 invested. This would be a good fund to have in a taxable account that you wanted to hold and have compound, however, since it would generate very little income that would be subject to taxes each year. The minimum investment shows how much you need to invest to buy into the fund the first time (after that, you can generally invest whatever amount you wish). In this case you only need to invest $1 to start, which again is very unusual since many funds require investments of $3000, $10,000, or more. If you have a lot to invest, such as when you’re investing in a retirement account, the minimums won’t matter because usually meet them. When you are just starting to invest when you’re young, however, they can be difficult to meet. 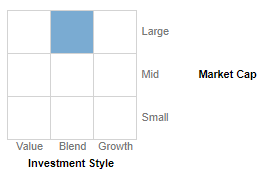 Another critical element is the style box, which is created for each stock fund by a company called Morningstar. One one side it shows the type of investing, value or growth. The other side shows the the size of the assets held, going from small stocks to large stocks. In general you’ll want to either have funds in all four corners of the box or funds at the top center (Large Blend) and bottom center (Small Blend) in your portfolio so that you cover all of the bases. We’ll go more into the investment styles in the next post in this series. That covers the main elements you should use in evaluating a mutual fund or ETF. Later in the series we’ll talk about gathering up your portfolio of funds, and then how to decide how much in each fund. For now, just take a look through the data on a few funds. You can also go to Vanguard and look at their funds, or go to Morningstar where you can get data on all sorts of funds. If you have a question about what you find, please leave a comment. Next Are You Ready for Your Tree Fall?